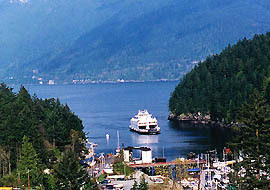 Bowen Island is also a popular destination for boaters who experience sheltered bays and safe anchorage, salmon fishing, dive sites and clean swimming beaches. Bowen is a two hour journey for boaters leaving Vancouver and running at about seven knots. Bowen Island contains 13,000 acres of treed land (primarily Cedar, Hemlock, Arbutus, and Douglas Fir) which is perfect for hiking and picnics. Grouse, mink, eagles, ravens, cormorants, deer and at least two colonies of blue herons call Bowen home. The island�s total size is 20 square miles or 12,500 acres. More than 1/3 is Crown land and 650 acres is parkland. Its coastline covers 23 miles with several public beaches available for swimming and beachcombing, interesting dives sites and kayaking destinations. Bowen has one of the mildest climates in Canada. Visitors will find several picnic grounds, restaurants, pubs, coffee shops, stores and gift shops to explore in Snug Cove near the ferry dock and two new commercial areas with shops and services are located a short walking distance above Snug Cove. Mariners will find two marinas. Visitors can also access many fine accommodations on Bowen for extended stays (no overnight camping or trailer parking is permitted on the island). Bowen is the first island municipality in the Islands Trust with an RCMP detachment, an elementary school, a middle school, a BC ambulance station and a volunteer fire department. The island is the permanent home of approximately 3,500 people. Over 400 artists and writers live on the island providing a strong arts community.